Cancer Of The Tongue. What Are The Signs Of Tongue Cancer? Cancer of the tongue has very good prospects for successful treatment if it is caught early enough. But what are the signs of tongue cancer? 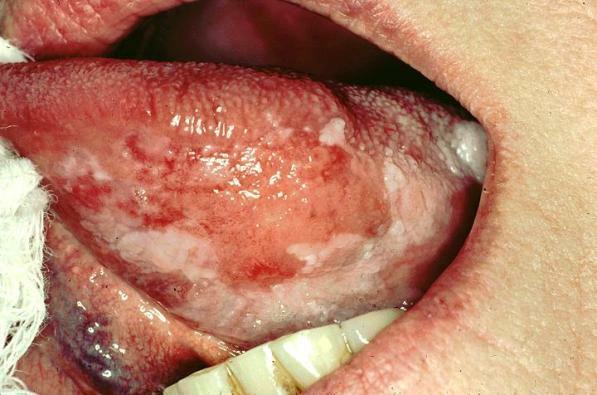 Tongue cancer can occur in different places all around the tongue. It does not always affect just one area, but can appear under the tongue, on the side of the tongue, on the top of the tongue, also at the tip, and also way back in your throat. Don't think that just because you have an "ulcer" on the tip of your tongue, it can't be cancer because you believe that cancer of the tongue only happens on the sides of the tongue. It can happen anywhere around the tongue and under the tongue. What does cancer of the tongue look like? Images courtesy of Dr. Martin Spiller. There is not one single kind of appearance, just the same as there is not one spot that it occurs at. It can have different appearances, depending on the type of cancer and the location. The most common location and appearance is probably on the side of the tongue, about halfway back. It looks like an ulcer, but there are a couple of clues that it might be something more than a simple ulcer. It may start off as a small white patch, which you can't rub off with a tissue. The "ulcer" has slightly raised edges, like the lip of a volcano. The area around the "ulcer" may be grey / white. The whole affected area may be slightly swollen. The middle bit is red, and the surface looks like it has been scraped away a bit. Just because it doesn't hurt, it doesn't mean it's not cancer. In other words, you can get cancer of the tongue and NOT FEEL much at all. It can look like a big ulcer, and you'd expect it to be quite sore - but it doesn't hurt much at all. DON'T decide about getting it checked, based on whether it hurts! GET IT CHECKED. Why do I go on and on about getting this stuff checked? Because the sooner you get it checked, the smaller it is likely to be; treatment will be SO MUCH SIMPLER and MUCH QUICKER. If you have some kind of funny ulcer on the side of your tongue, and you decide to "see how it goes for a few weeks", you are possibly letting a cancer grow even more. By the time you finally get around to seeing a dentist or doctor, it will have advanced significantly. Treatment may be more complicated. People who smoke, whether it's cigarettes, cigars or a pipe. People who drink alcohol, especially spirits such as whisky, bourbon, rum etc. People over around 50 years of age, although ANY age can get it. These factors can combine to increase the risk. For example, a heavy smoker who also drinks strong spirits (liquor) and is aged 60 - 70 will have a significantly higher risk of getting tongue cancer than someone who does not smoke, drinks alcohol in moderation and is (say) 30 years old. What treatments are there for tongue cancer? The treatment depends on how big the cancer is, and exactly where it is located. Usually this will be assessed by a team of specialists, such as an oral surgeon, an ENT consultant, and of course a cancer specialist. For small cancers, the best and quickest treatment is to remove it surgically. Done. For bigger cancers, the surgery will be more involved, and there may be some changes to swallowing and speech afterwards. You may also need radiotherapy in addition. If the cancer has spread more, then again the surgery will be more extensive, and you will definitely need radiotherapy and possibly chemotherapy. Changes to swallowing and speech may be significant. Obviously, early treatment is better! If you think you may have any signs of tongue cancer, such as an odd-looking bump, a swelling or a white patch, or an ulcer that doesn't start to improve within 5 days - GET IT CHECKED! Cancer of the tongue can be treated very quickly and simply if it's caught early enough. But it's up to you to get yourself to a health professional as soon as possible!